With the state’s breathtaking mountains, National Parks and rugged monuments, it’s clear why many people choose to call Utah home. Homebuyers will find that Utah mortgage rates tend to reflect the national average. Three Utah counties have conforming loan limits above the baseline $453,100 limit. Housing prices in Utah’s mortgage market are on the rise as demand for Utah homes outpaces supply. Overall, Utah mortgage rates are similar to the rates in the rest of the country. 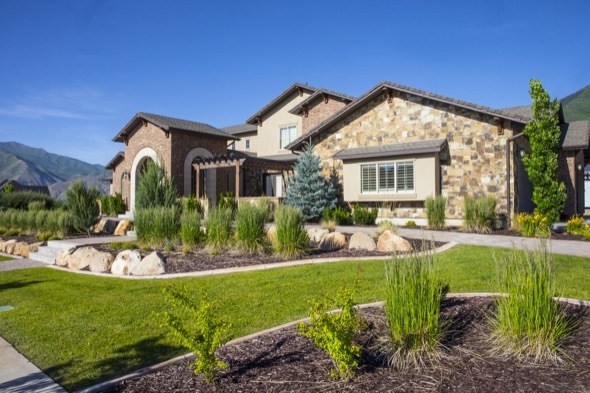 Demand is high in the Utah mortgage market. Housing prices are on the rise in the state which means you may not want to delay getting pre-approved and shopping for a Utah home. Three Utah counties have conforming loan limits that are higher than the $453,100 limit that’s standard in most U.S. counties. Those Utah counties are: Salt Lake, Summit and Tooele. The fact that the conforming loan limit is higher in those three counties tells you that home prices in the counties are expensive as well. Any loan that exceeds the conforming loan limit is a jumbo loan and generally comes with a higher interest rate. Though the housing market in Utah is on the upswing there is still foreclosure inventory in the state. If you want to pay a low price for your Utah home, you may be interested in Utah’s foreclosure auctions. In Utah, most foreclosures happen through a non-judicial power-of-sale process, not a lawsuit. The lender can sell the home without taking the borrower to court. However, even without a judicial process foreclosure can still take around four months in Utah. If you’re a buyer you can look for listings that are in pre-foreclosure and bid on them, or wait until the property becomes Real Estate Owned after the foreclosure auction and make your offer then. If you’re the homeowner, be aware that Utah is a deficiency state, which means that the lender can go after your assets for the “deficiency” after a foreclosure sale (i.e. the difference between what the home fetches at the foreclosure auction and the amount you still owe on the mortgage). If you’re a Utah homeowner and you think you’re at risk of foreclosure you can dial 2-1-1 to receive foreclosure prevention resources. You can also consult one of the HUD-approved housing counselors in your area. Bilingual assistance is available. If you choose to buy a home in a Utah city with high demand and low inventory such as Salt Lake City, it’s a good idea to move quickly when you find the right property. That means having your pre-approval from a lender and having a real estate lawyer lined up to guide you through the closing process. Some Utah listings in hot real estate markets receive multiple offers. Before you get sucked into a bidding war, be honest with yourself about how much you can afford to pay each month and set a firm budget ceiling. A 30-year fixed-rate mortgage is what most homebuyers choose. When you commit to a 30-year fixed-rate mortgage your monthly payments will stay the same for all 30 years, unless you opt to refinance or you make prepayments. Over time, a larger portion of your monthly payments will go to paying down the principal on the loan as opposed to paying interest to your lender. The average Utah 30-year fixed-rate mortgage rate is 4.04%. In most counties, any loan that’s $453,100 or less is a “conforming loan.” That means it qualifies for normal interest rates and can be re-sold on the secondary mortgage market. Mortgages that exceed the conforming loan limit in a given county are considered “jumbo loans” and generally carry a higher interest rate to compensate the bank for the risk of lending such a large sum. The average Utah jumbo loan rate is 4.73%. As the name suggests, an adjustable-rate mortgage has an interest rate that can change over time. After an introductory period of between one and 10 years (during which you will get a discount on your interest rate) the lender can raise your rate once a year, up to a cap that’s specified in the mortgage documents. Some buyers are attracted to the low introductory rate but then find themselves unable to keep up with payments after their rate increases. To keep this from happening to you, make sure you understand your mortgage terms and are capable of making higher monthly payments after the introductory period. Even if you plan to sell the home before the introductory period ends it’s wise to have a cushion in case the sale takes longer than you expected. The average rate for an ARM in Utah is 3.61%. Utah has resources in place for residents who need help buying or holding on to a home. For example, the Utah Housing Corporation (UHC) offers down payment assistance to eligible borrowers. Through a network of Utah Housing participating lenders, the UHC helps homebuyers who are seeking a conventional, FHA or VA loan. The UHC runs several programs, some of which are only available to first-time homebuyers and some are for those who are seeking to refinance or buy another home. Only 30-year fixed-rate mortgages are available through UHC programs, with competitive rates. The lowest interest rates are for the FirstHome program, which as the name suggests is only available to first-time homebuyers. If you qualify for a FirstHome Loan based on your income, credit score, loan type (FHA or VA) and home purchase price you can borrow up to 6% of the mortgage loan to use for down payment and closing costs. Another UHC program, the HomeAgain loan, is available to previous homebuyers and first-time homebuyers alike. It has a higher income limit than FirstHome and, unlike FirstHome, has no purchase price limit on the home you’re financing. You can borrow up to 6% of the loan to use for down payment and closing costs. A UHC Score loan lets you borrow up to 4% of the mortgage total to use for down payment and closing costs. It’s available to previous homebuyers and first-time homebuyers and has a lower minimum credit score than HomeAgain or FirstHome (620 vs. 660). If you want a Fannie Mae conventional loan instead of a VA or FHA loan you can apply for the UHC’s NoMI Loan, which gives homebuyers a break on mortgage insurance and allows them to finance up to 4% of the mortgage loan for down payment and closing costs. However, this program comes with the highest minimum credit score – 700. You can find a comparison of the UHC programs here. Utah has no real estate transfer taxes, which means that if you sell your home in Utah you won’t have to pay special taxes to transfer the deed to the buyer. Utah is a flat tax state that charges a rate of 5% for all income levels. When you fill out your Utah state income tax return you won’t be able to itemize deductions (like mortgage interest) or take a standard deduction. However, depending on your income you may be able to claim the taxpayer tax credit. It’s a tax credit equal to 6% of the total of all the federal deductions you claim (except for the deduction of state income taxes), plus your Utah personal exemptions. So, if you qualify for that tax credit and you itemized your federal income tax deductions to deduct your mortgage interest, you’ll get a break on your Utah state income taxes. If you think it’s time to refinance your Utah mortgage, you don’t have to use the same lender who issued your original mortgage if you can find a better deal elsewhere. And because refinancing your mortgage involves paying a new set of closing costs, it’s wise to refinance only if you plan to stay in the home long enough for your monthly mortgage savings to outweigh what you spent to refinance. The UHC offers Utah residents help with refinancing. If you used a UHC loan insured by FHA and closed on or after June 1, 2009 you are probably eligible for a UHC/FHA Streamline Refinance. A UHC participating lender can walk you through the process, but the most you would pay out of pocket to refinance would be $100. You can’t get cash back from a UHC refinance, but you can skip the home appraisal process, which will save you money.